PS: If you need a personal Hygge coach, get in touch! PS: Wenn ihr einen Hygge Coach braucht, setzt euch mit mir in Verbindung! I guess this is where we leave comments….great to hear that your mistletoe is continuing like mine. We live within sight of the magical Glastonbury Tor..so its not surprising that that Mistletoe rated high in the rituals of the druids…it really grows well around here too. Looks like an awe-inspiring place, Noelle, there’s so much we don’t know and all these footprints of the past are utterly fascinating. This is a great read Annette. Nestled under a comforter enjoying morning coffee, I am practicing hygge! Mistletoe is enchanting and your photos carry that mood as well. Wishing you a happy week. I had the same feelings as you when I first read about hygge last year. Perhaps the Danes think they invented it because most of Scandinavia is all about minimalism which isn’t usually very cosy. 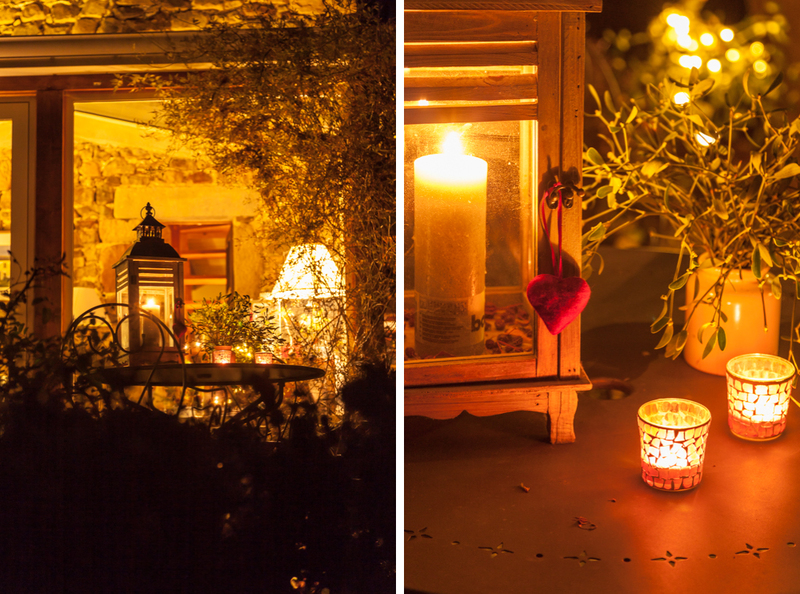 Oh you have really set the scene, with the mistletoe and all the candles – it all looks so inviting! I have tried a few times to establish mistletoe on our apple trees but so far without success – thanks for sharing yours! Your pictures make me dream of this Sheep Dip stuff on your porch or Wintergarten. 😉 I thought it rather funny as well when the „Hygge“ hype started last year. It seems to sell – even a well-known German coffee trader carries a book the subject and the appropriate supplies that go with it. I don’t know, maybe it is the current „Zeitgeist“ that we need whoever to tell us how to do things that we have done all our lives?! Or is it just the word itself, because „Gemütlichkeit“ is also one of those words that you cannot really translate into English, for example. Anyway, your home looks most „hyggely“ 😉 and I love the abundant use you are making of your mistletoe. There is lot of it high up in the trees around here, but the bunches have managed to withstand the winter storms so far. I keep looking for mistletoe on the ground, but no luck so far. Happy New Year, Annette! With our winter we practice coziness too! 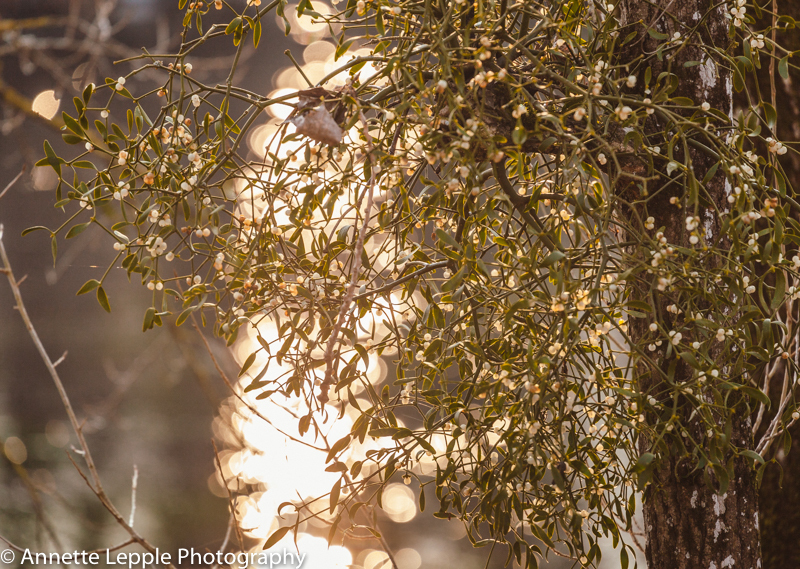 Love the info on mistletoe and especially your cozy photos! No, you don’t need that so I guess I rather write about something else 😉 I think one can be gemütlich all by oneself too…such a relief! 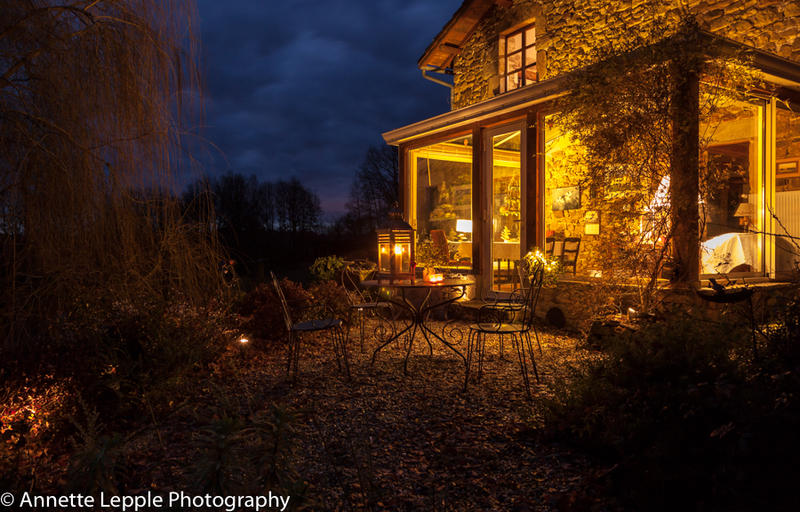 After seeing your warmly lit house in the woods, I have no doubt that you could write a book on cozy living, Annette! There’s no mistletoe growing here in Southern California. I expect it needs lots of water! I can’t even remember seeing clumps sold in advance of the holidays – unless you count fake plastic versions, which just don’t do the job. liebe Annette, und wie ich mich freuen würde über Dein Hygge-Buch. Ich weiss ja, Du liebst und lebst dieses Thema schon ausgiebig. Das haben Deine vielen Beiträge sehr wohl gezeigt. Zu bedenken wäre dabei, vielleicht, dass ein jeder von uns seine eigene Hyggeligkeit lebt und liebt. Je nach der Umgebung halt, in der er wohnt. Die nämlich finde ich, leistet einen grossen Beitrag dazu und ist Deco- und damit Bildausschlaggebend. Und wir müssen nicht alles kaufen gehen. Das schont erstens unser Portemonnaie und zweitens ist es doch erst richtig gemütlich, wenn die Umgebung dazu stimmig ist. Für Städter dürfte es schwierig sein, Landhausgemütlichkeit in die enge Blockwohnung zu zaubern. I think gemütlich is perfectly fine, no need for hygge! What a beautiful setting. I want to grab a mug full of something warm and I wouldn’t even mind sitting out on the patio! Ich bin begeistert von Deinem Wintergarten, abends mit Beleuchtung – wunderbar! Leider haben wir so eines nicht, aber in unserem alten Häuschen mit dem ollen Kachelofen ist es auch lauschig…..
Liebe Grüße und genieße die stade Zeit! Lovely! Thanks for sharing, Annette.